Beautiful Lake Austin and Lake Travis, Stunning Texas Hill Country, and Totally Unique Austin . . .what more could you ask for? Leave your worries at the city limits, put on some casual clothes, and prepare yourself for experiences you will find only in Austin. A bit quirky, definitely high-tech, and far from anything ordinary, Austin has a heart and soul worth experiencing. Some of the favorite local sites. . . .
Chuy's, at 1728 Barton Springs, is a fun Mexican food place decorated with Elvis, paper mache, and hubcaps. Enjoy some Austin Tex Mex in casual atmospheres of Guero's, at 1412 South Congress, or Taco Xpress at 2529 S Lamar. Enjoy homemade and healthy food at the original Kerbey Lane Cafe, South Lamar, a great place for breakfast. Listen to music at the delightful open-air venue at The Backyard, 13101 West U.S. 71. Splash Party Movie Nights are a great way to spend a summer evening at the Deep Eddy Pool. Swim in the pool, then sit on a blanket and see a movie. Sit out on the deck, listen to the jukebox, have a beer and mind your own business at Dry Creek Saloon on Mount Bonnell Road. See a play at the old timey Paramount Theater at 713 Congress Avenue. In the summer, they show classic movies. Spend the evening on Sixth Street in New Orleans style where the street is blocked off and becomes a glittering strip of bars and live music clubs. Austin's E. 6th Street Map. Bats, Bats, and More Bats! From mid-March through mid-October see the dramatic night flight of the bats from the Congress Avenue Bridge. Watch independent films, spaghetti westerns, and UT football at the Alamo Drafthouse Cinemas. Come to Central Market, 4001 North Lamar Boulevard, a showcase grocery store and tourist spot, to buy groceries, have a great meal, or people watch. Climb the 99 steps to Mt. Bonnell at 3800 Mt. Bonnell Road to see Austin from one of the highest vantage points. It is known as a popular spot for young couples who want to watch the stars come out at night. Be careful who you climb the stairs with--you might fall in love according to the local legend. Join Willie Nelson in claiming the Broken Spoke, 3201 South Lamar Boulevard, as your favorite watering hole and dance hall. The BookPeople, 603 North Lamar, is one of the city’s major literary resources, locally owned and operated. It has a huge selection of books in all genres. 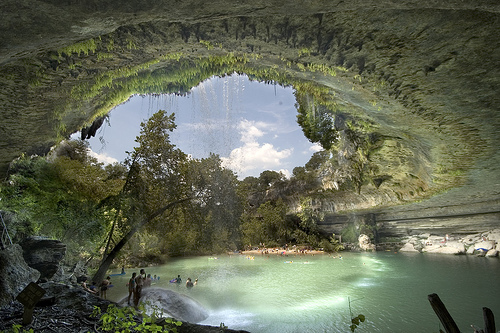 Swim in Hamilton Pool Preserve, located about 30 miles west of Austin on FM 3238. There is a 45 foot water fall creating a great swimming hole. Take a dip in the Barton Springs Pool, 2201 Barton Springs Road, often considered the soul of Austin. It is a treasured, spring-fed pool that stands as a commitment to the environment and a place of psychological and spiritual renewal. Although Farmer's Markets are not unique to Austin, there is certainly an Austin feel at all of these markets. Come by produce, special sauces and more! Why the slogan "Keep Austin Weird" ? Check out below. . .